It's taken awhile, but I'm finally at the point where I recognize the major impact lighting has on a space. If this weren't true, I wouldn't have driven 12 hours just for the sake of procuring these lights for La Maisonnette. Truly, when you walk into a room, it's the lighting you notice first. Because stylish lighting tends to be on the pricier end, we often ignore this important design feature. I've learned that it's worth saving up for (even if it takes awhile) and that good deals can be had...especially if you do your homework. It's so true! Good lighting really does have a huge effect on a room. We have this obnoxious fluorescent light in our kitchen and we call it the "angry light" since it tends to make us more ornery. Great post, love having more resources. I really like that hanging pendant with the crystals. It think they had something like that in a pottery barn or maybe it was an Anthro catalog awhile ago. While on the topic - may I also recommend a local resource (to SLC). 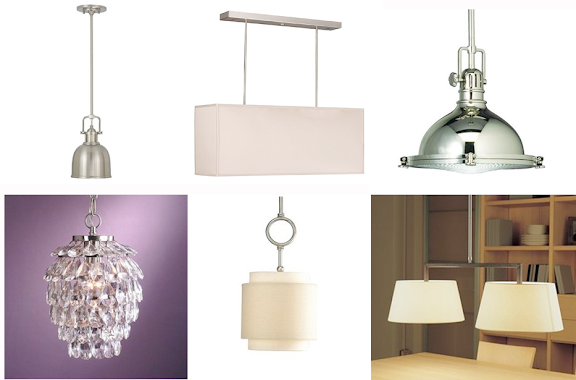 The Lamp Company located on 700 East and about 1400 South will help you create custom lighting for your space. The owners (who happen to be my Mom and Dad) and staff are happy to help you reinvent the lamps you already own - or will help you create something specific for your space. Both my sisters - custom lampshades (as seen in the last post) are also an option at The Lamp Co.
Just had to add some "enlightenment" to this topic, as I'm kind of fond of the folks at the Lamp Co.
You totally read my mind I am curretnly looking for a fixture for our dining area and I was seriously going to email you about it. Thank you! You are reading my mind! I've been browsing lighting fixtures for the last couple of weeks, I'm going to NY in May, the soup recipe. Lady. You are amazing! Great pictures of lighting! Another fantastic source in Charlottesville, VA is The Shade Shop & Lighting Gallery. They have an amazing selection of shades, as well as lamps, chandeliers, etc. Take a look at http://www.theshadeshop.com.